A fire at Witherle Woods over the weekend required digging and cleanup once the fire was extinguished. 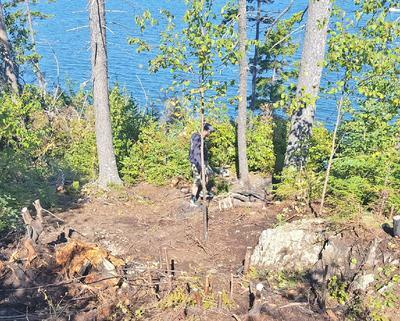 The Castine Fire and Rescue Department responded to a fire at Witherle Woods shortly after 5:30 p.m. on Saturday, September 8, according to a press release from the department. The fire was reported by a family out hiking the trails. Two firefighters immediately responded via the new utility vehicle donated by Brooke Parish, according to the press release. Upon arrival, a 20’ x 40’ area was engulfed in flames and dense smoke. The fire was knocked down and a second crew arrived to help mop up. The cause of fire was determined to be an improperly extinguished campfire that had smoldered over the previous night and flared up when the wind began coming off the bay Saturday evening. Due to the period of time the fire had smoldered, the area required extensive overhaul to dig up hot spots and ensure the fire would not rekindle. Firefighters finally cleared the scene around 9:30 p.m. and monitored the area the following day to ensure all hot spots had been put out. The Maine Forest Ranger department was on scene Sunday morning to investigate. Fires are not allowed in Witherle Woods, per guidelines set by Maine Coast Heritage Trust, according to fire captain Kyle Fallon. The new UTV allowed many quick shuttles of personnel, equipment, and water. Without it, initial response would have been delayed and the fire would have spread further, according to the release. A crew of 13 responders was on hand to fight the fire and clean up the aftermath. “It was a fantastic team effort from everyone. The crew’s training really shined through and we made short work of what could have been a major incident,” said Fallon.